Nomad Factory introduces MAGNETIC II, a Reel-to-Reel Audio Tape Warming effect that gives your tracks the elusive vintage tape sound which your ears crave. This effect can inject sterile audio with the warmth and character of classic tube circuitry and analog tape saturation. The plug-in features pure analog reel-to-reel tape speeds, tape/tube saturation and tape color effects, as well as a dedicated vintage style EQ and a built in Boost mastering section. The result is a creamy, warm sound that can only be achieved by MAGNETIC II. Never before has such a great sounding plug-in effect been so easy to use! At first touch, the plug-in interface is modern, simple, and extremely user-friendly which instantly allows you to dial in usable sounds. MAGNETIC II can be used in many different musical ways. Try using it on individual tracks to add subtle warmth and tape color to your drums or use it to create a filtered cassette AM-radio effect on a vocal. But that's not all, when used on the master bus, MAGNETIC II can warm your entire mix and boost it up to broadcast level. It's just like having a 30+ year old reel-to-reel tape machine at your fingertips, without all the maintenance costs. REAL TAPE MODEL Mode : To engage the new Real Tape Model mode, simply turn the Reel Speed knob between 1 and 30 and it will activate the selector buttons on the left. Magnetic Tape Color : When the Reel Speed knob is set to DASH, this engages the original Magnetic Tape-Color sound. Any other Reel Speed Knob setting allows you to select between different Tape Model modes, including Magnetic. Every hit album made before the 1990's was recorded on some form of Tape The Beatles, Jimi Hendrix, Led Zeppelin, The Doors, Queen, the list goes on and on. That's why those songs still sound so good today, because the way they were recorded. Even today, some artists of all genres prefer analog tape's "musical", "natural" and especially "warm" sound. Due to harmonic distortion, bass can thicken up, creating the illusion of a fuller-sounding mix. In addition, the high end can be slightly compressed, which is more natural to the human ear. It is common for artists to record to digital and re-record the tracks to analog reels for this effect of "natural" sound. In addition to all of these attributes of tape, tape saturation is a unique form of distortion that many artists find very pleasing. Before large hard disks became economical enough to make hard disk recorders viable, studio digital recording meant recording on digital tape. Mitsubishi's ProDigi and Sony's Digital Audio Stationary Head (DASH) were the primary digital reel-to-reel formats in use in recording studios from the early 1980s through the mid 1990's. With the MAGNETIC, Nomad Factory has captured the essence of DASH technology and made the sound of high-fidelity digital tape recording available in plug-in format. REEL SPEED controls the speed of the virtual tape machine. Higher speeds give you more studio-quality fidelity; lower speeds sound more like a cassette tape. The DASH setting gives you the highest-fidelity of digital audio tape predominately used in the 80s and 90s. SATURATION gives different levels of tube and/or tape saturation effects. Recreates the warmth and character of classic tube circuitry and analog tape saturation. TAPE COLOR provides the highly sought-after sound of Natural, Vintage and Modern Tape Compression. LOWS controls the amount of low frequency equalization. Select the boost/cut frequency range with the Body, Warm, and Lush Settings. HIGHS control the amount of high frequency equalization. Select the boost/cut frequency range with the Detail, Focus and Brilliance Settings. BOOST switches on/off the built-in Mastering Limiter section. This incorporates multiple stages of limiting and a look-ahead brickwall limiter to deliver first-class peak reduction. Adjust the Gain and Ceiling Knobs to achieve High-Resolution Limiting. GAIN sets the threshold for the incoming signal. Higher settings result in a louder sound. CEILING sets the brickwall output level so that it limits all peaks above the number it is set to. VU METER shows the amount of limiting taken place when the Boost circuit is engaged. REEL TAPE MODELS give you the color of the famous vintage tape machines. To engage the new Tape Model mode, simply turn the Reel Speed knob between 1 and 30 and it will activate the selector buttons on the left. 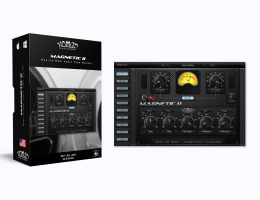 Magnetic is designed to be used as an insert type effect and should be configured into the effects chain in series with the signal path the same way a graphic equalizer or limiter would be connected. In other words, the entire signal should pass through the plugin. Setting up Magnetic as an echo send or AUX device like a digital reverb is not recommended, as the processed effect is not fully realized when summed with the original source audio. You may download the trial version here.